When bitter cold winter temps come around, perhaps the last thing on your mind is hiking. I get that. I’m no fan of the cold either. As with everything else though, Mother Nature has a reward if you are willing to tolerate the temporary discomfort. Frozen waterfalls! 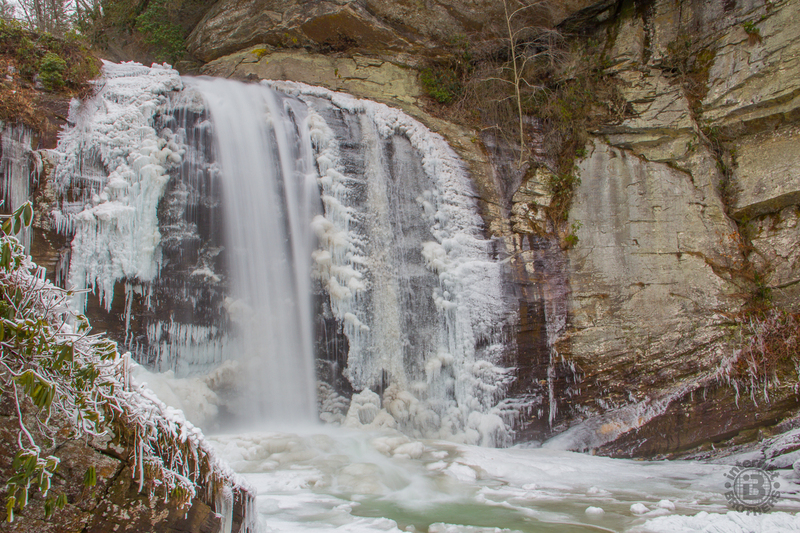 It’s a rare occurrence in Western North Carolina, but usually once a year, the air will stay cold enough, long enough, to freeze some of the waterfalls in Pisgah National Forest. There are several that don’t even require much of a walk to get to. So on a cold morning, Saturday, February 21, 2015, I put on long johns and heavy pants, several core layers, my heaviest wool socks, a nice, warm knit balaclava, ice traction devices for my boots, and ventured out in search of frozen waterfalls. Here is what I found. I knew from the moment I left the house that this would be the first destination. It’s easy to get to… right along the side of Scenic Hwy 276 just a few short miles past the Pisgah Ranger Station west of Brevard. It seems quite a few others had the same brilliant plan. Even though I arrived well before 9:00, there were already four other intrepid photographers already setup, tripods at the ready. I sure am glad I thought to put on the Yaktrax, as the stairs down to the viewing platform were an accident waiting to happen. The ice on the stairway deterred several out-of-state tourists just in the short time I was there. But not the ice climbers. As I was leaving, there were a couple getting geared up with their ropes, ice axes, and crampons to tackle the sheer face of Looking Glass Falls. This may be the most photographed spot in all of North Carolina. Because of the natural beauty, convenient access, and awesome power, Looking Glass Falls is visited by hundreds nearly every day. Whether taken with a flip phone, a point-and-shoot, or the fanciest professional equipment, everyone who stops has to take at least one picture of this signature waterfall. While taking pictures at Looking Glass, one of the other photographers there asked if anyone was going to Moore Cove Falls. I said, yes, that was my next destination. In the interest of safety, he suggested we make the trip together. I was certainly in agreement with that because it’s about a three-quarter mile hike from the pullout on Hwy 276 to the waterfall. With ice and snow you just never know what you’re going to get, so it would be great to have a companion just in case of a falling accident. With that in mind, Chuck Hill and I introduced ourselves to each other, exchanged cards, and met at the Moore Cove trailhead. Once again I was glad to have the Yaktrax as the first hundred yards consisted of ice and compacted snow on an uphill path. Surprisingly, Moore Cove Falls was not completely frozen, but it had a very large cone working at the base of the plunge. The highlight of this visit, however, was Moore Creek on the way in and out of the forest. Covered with a thin layer of ice and snow, it created a beautiful scene, ready-made for the cameras. Chuck and I said farewell, with a promise to exchange photos and perhaps get together again some day. I continued up Hwy 276 to Forest Road 475B, otherwise known as Headwaters Road. I was the first one to brave the dirt and gravel service road on this day, as the only tracks in the snow were older and frozen over. This would be the first true test of four-wheelin’ for my new Subaru. The two miles of twisty uphill and nervous downhill on solid ice with a fresh covering of snow put the drive train through its paces. When I arrived at Forest Road 5043, I breathed a sigh of relief, and gave the dashboard a pat on the back. Well done! FR 5043 is the trailhead for the short, half-mile trip to Log Hollow Falls. By now new snow was falling. The path had a fresh white coating with no footsteps. Snow seems to bring with it silence. The only sound in the forest was the crunch of my boots on the icy trail. I paused several times to revel in the sheer winter beauty, definitely delighted I had made the decision to brave the elements. Log Hollow was definitely the most frozen of all the waterfalls I visited. It was covered with a several-feet-thick layering of silver and white that gleamed and glistened as I approached. I could hear running water underneath, but there was no outward appearance. 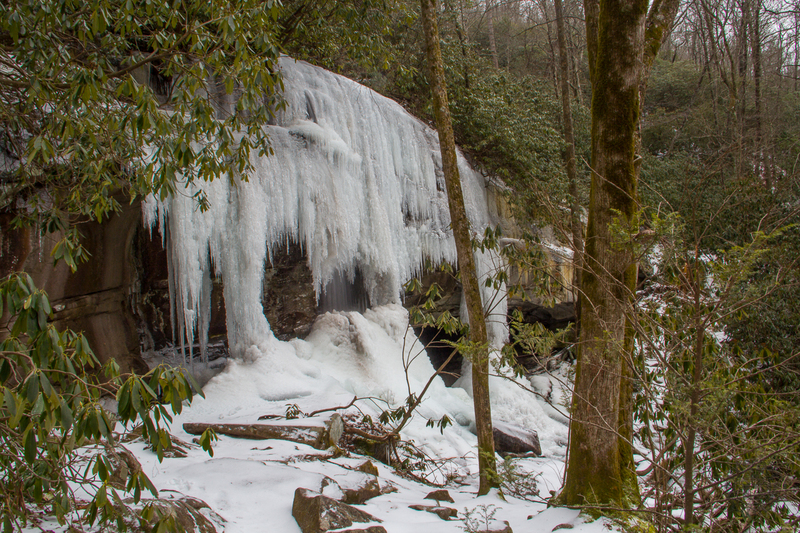 Always beautiful no matter the season, this remains one of my favorite waterfalls in all of Pisgah National Forest. It is another several miles of hairpin turns and dicey descents on Headwaters Road from Log Hollow to my next destination, Slick Rock Falls. Again, the new Subaru was marvelous. The good news about Slick Rock is it’s right beside the road. No more than a couple hundred yards walk from the parking pullout, you can even see it from the road. Since this one is fairly close to the Fish Hatchery and Pisgah Education Center at the south end of Headwaters Road, there were a couple other vehicles there that had come up from below. I didn’t know what to expect because Slick Rock is usually a small, dribbling waterfall, but I was very pleasantly surprised. In the summer, Slick Rock Falls can be barely more than a trickle, just kind of spraying over its precipice. But on this day, Slick Rock had the best icicles of all the ones I visited. Some reached all the way to the plunge cone, while others were long spikes reminiscent of icy stalactites. You could even peer behind the wall of ice, but I wasn’t about to tempt the frozen daggers to come crashing down on me. My final stop was at Rockhouse Falls. This small beauty sits right along the side of Fish Hatchery Road. I navigated the final slippery half mile of Headwaters Road from Slick Rock Falls to its terminus and turned right. It’s less than a quarter mile to the pullout for Rockhouse Creek. Sitting right in a hairpin turn on the paved forest road, you can view Rockhouse Falls from the road, or from a short 50-foot walk to a nice boulder in its basin. I met a National Forest maintenance worker who was also enjoying the simple elegance of this captivating scene. He had to be there for work, but could still savor Nature’s treasure. I didn’t have to be there at all, but I sure am glad I was. 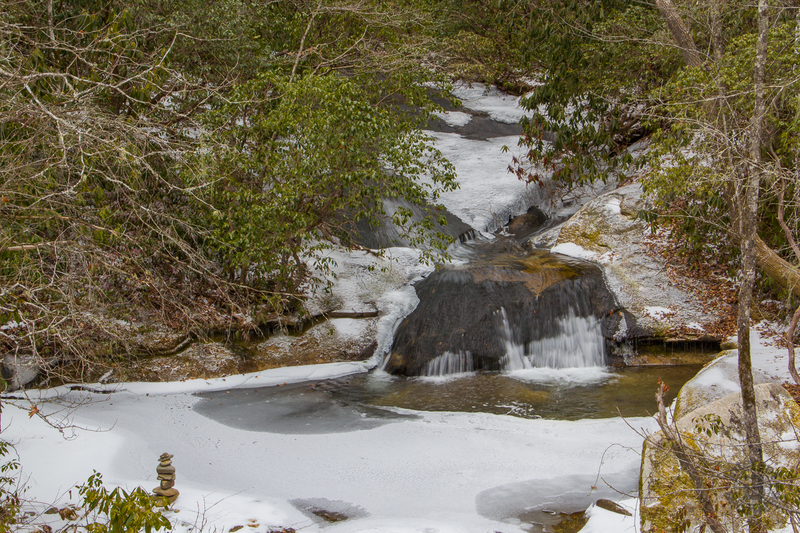 Don’t let winter keep you from appreciating all that our preserved wild places have to offer. 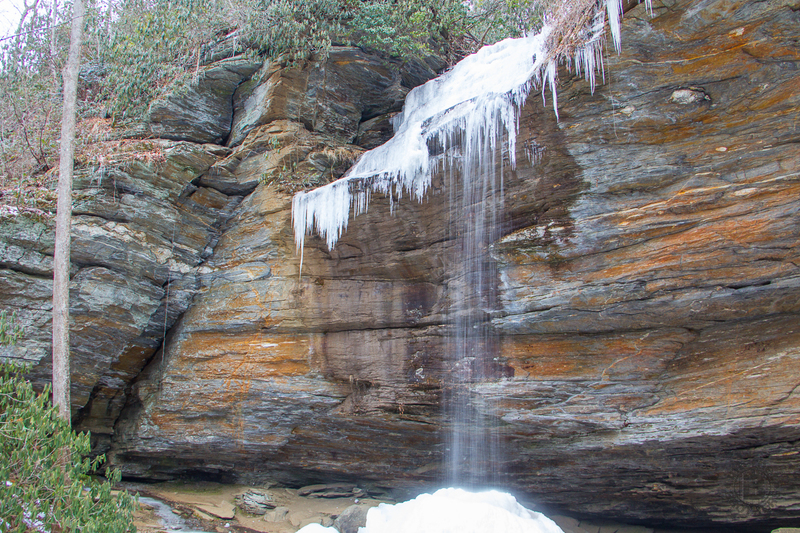 Because of its small stature, Rockhouse Falls had mostly melted by the time I got there. Until this past Autumn, I didn’t even know it was there. I have driven past it more than a dozen times over the years and simply never noticed it. Now that I’m aware, I make a point of stopping to enjoy its understated elegance whenever I pass by. 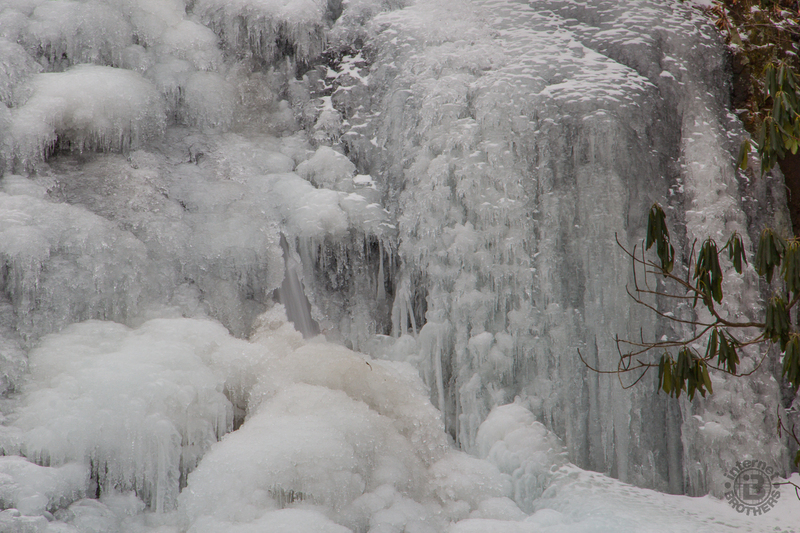 Below are a few more photos taken along the pathways and roadways on this tour of frozen waterfalls.